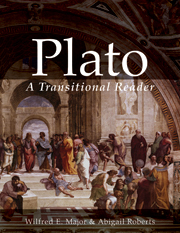 This graded reader helps students make the transition from beginning instruction in Greek to reading unaltered texts of Plato. It features six Greek passages: four extracts from the Republic, the summary of the Republic in the Timaeus, and the beginning of the Euthyphro, which sets the scene for the Apology. Each passage is presented in multiple versions, beginning with a very basic outline and culminating in the passage as Plato wrote it. Passages are accompanied by facing vocabulary and notes. Each unit includes a review of grammar crucial for the passage. Appendices provide two vocabulary lists that help students identify which words to memorize first. Students completing this reader will be prepared to read full Platonic dialogues and other works in unadapted Greek.